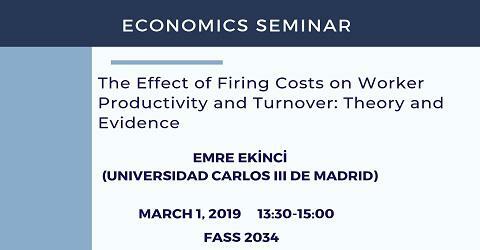 Abstract: This paper explores, both theoretically and empirically, how firing costs affect worker productivity and turnover. We develop a model in which workers are essential to knowledge transfer between firms and worker effort is firm-specific in the sense that a worker can be fired before reaping any returns from effort (i.e., before acquiring knowledge valuable to competing firms). Our model shows that the hold-up risk faced by workers induces them to curtail their innovative effort. However, an increase in firing costs inhibits the firm’s ability to hold up the worker and thereby leads the worker to exert higher effort. The increased productivity, in turn, affects turnover probability and the magnitude of this effect depends primarily on the degree to which the worker’s knowledge stock is transferable to competing firms. In our empirical analysis, we consider the passage of the wrongful discharge laws in the U.S. as a mechanism that increases firing costs. Using individual-level data constructed from patents issued to inventors by the United States Patent and Trademark Office (USPTO), we find supporting evidence for the model’s implications.